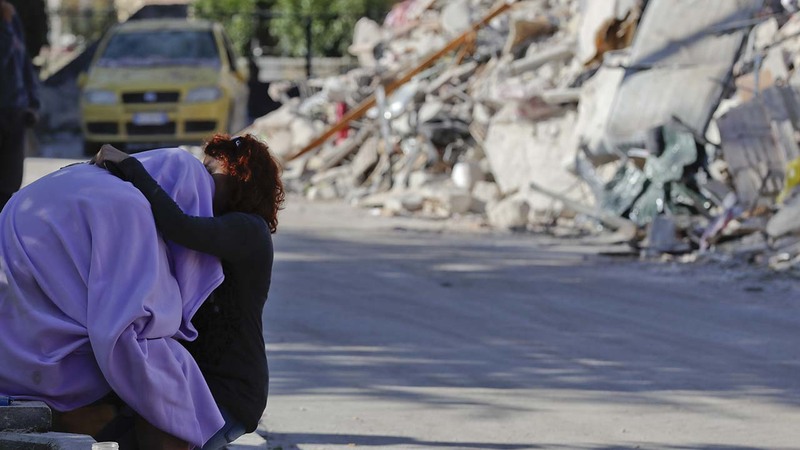 ASCOLI PICENO, Italy -- Authorities say the death toll in the earthquake that struck central Italy has risen to 291 after a man being treated in a hospital succumbed to his injuries. The Civic Protection agency said Saturday that the man, who was injured in the town of Arquata del Tronto, had been receiving treatment at a hospital in Perugia. Italy is observing a day of national mourning Saturday for those killed by the earthquake that toppled three towns before dawn on Wednesday. A young man wept over a little girl's small white coffin, while a woman nearby gently stroked another white coffin. Everywhere people hugged and cried as they stood amid 34 coffins laid out in a community gym in Ascoli Piceno, where the state funeral is to be held in the presence of President Sergio Mattarella and Premier Matteo Renzi. "It is a great tragedy. There are no words to describe it," said Gina Razzetti, a town resident who joined hundreds of local people for the funeral. "Each one of us has our pain inside. We are thinking about the families who lost relatives, who lost their homes, who lost everything." Many children and elderly people were killed. Some of the older residents had grandchildren visiting in the last days of summer. The magnitude 6.2 quake struck at 3:36 a.m. on Wednesday and was felt across a broad swath of central Italy. At least 284 people were killed, but the death toll could rise as recovery efforts continue. Several people are still unaccounted for. "The melancholy grabs on to your heart, you feel a sense of weakness, of depression," said Fiore Ciotto, a resident of Ascoli Piceno who arrived for the funeral. "An event like this weakens you physically and mentally." Funerals for some victims took place on Friday, while those for many others are expected in the coming days. Ahead of the funeral, the president visited Amatrice, where 224 people died. There were also 11 deaths in nearby Accumoli and 49 in Arquata del Tronto, about 10 miles (16 kilometers) north of Amatrice. Mattarella arrived by helicopter at the edge of Amatrice, a once-picturesque stone town, and was shown the extent of the damage by the mayor, Sergio Pirozzi. The president met and thanked rescue workers who have been working since early Wednesday to save people trapped in rubble and recover the dead. Due to the vast extent and severity of the damage, he could survey the town only at a distance because it was too dangerous to enter the sealed-off town center. Overnight, residents of the area were rattled yet again by a series of aftershocks. The strongest, at 4:50 a.m., had a magnitude of 4.2, according to the U.S. Geological Survey, while the Italian geophysics institute measured it at 4. The Italian institute and other authorities say that the ground below Accumoli sank 20 centimeters (8 inches) due to the earthquake, according to satellite images. Many of the people left homeless have been spending their nights in tent cities where volunteers have been working to provide basic amenities.